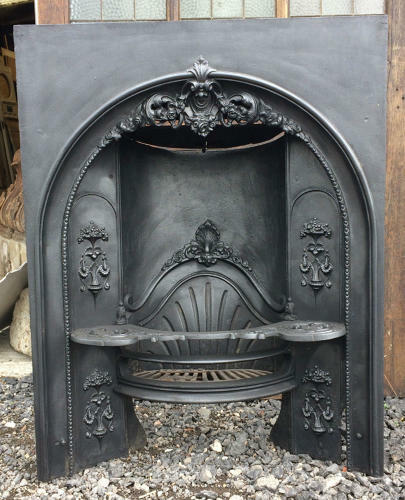 A very pretty, decorative, Georgian cast iron hobgrate fire, complete and original. The fire has beautiful detailing, with scrolling designs, leaves and flowers. There are fan style castings with flowers on the legs and the quality of the castings are very fine. The fire has a decorative cast iron back and a hobgrate stand on either side of the grill for warming drinks or small pots. The hobgrate has a traditional Georgian barrel back. The fire is very heavy and of a good size. The iron has been blacked and polished, leaving a lovely finish. The item is in original condition with grill and smoke flap and is suitable for minimal use with wood (not coal). The fire is antique and therefore has some areas of damage. The smoke flap has had a repair and there is some damage to the side of the barrel back. The left leg has some damage but once installed this will not be particuarly noticable. The original grill has been repaired but will need to be permanetly fixed in place by purchaser. The cast iron back has a crack and there is surface rust to the back of the fire. Please see photographs for details. The fire is an attractive item with a great deal of style and quality design. It is rare to find a Georgian hobgrate with all of its original features and this fire would make a fantastic decorative item that can occasionally be used. Perfect for a kitchen or living room and would add great character to a home.